What do you get if you put the country’s best screen writer and the countries best comedy mind with a selection of the best comedy performers of the day? Well, if the day happened to occur during the last two decades of the twentieth century, what you would get is – BLACKADDER. Messrs. Curtis and Elton (Richard and Ben to their friends) create best loved sitcom characters brought to life by national institutions; Rowan Atkinson, Tony Robinson, Steven Fry, Hugh Laurie and Tim McInnerny (with a splash of Rik Mayall, Ade Edmunson and Miranda Richardson to taste) during Blackadder’s four series run. The stage version is the brainchild of local thespian Alistair Cheetham who took most of the scripts from the last series – Blackadder goes Forth – and amalgamated them into one show. With kind permission from Alistair and from Richard Curtis himself (all proceeds for royalties going to Comic Relief) this WWI themed classic is fast becoming a nationwide Theatre Company favourite. Foot of the Barrel is a fast growing Theatre Company hosting local stage shows and stand-up comedy nights. In recent years, they have produced a variety of stage works to sellout audiences, including; Harold Pinter’s ‘The Dumbwaiter’, John Godber’s ‘Bouncers’, ‘Allo Allo’ (on stage), Nick Dear’s ‘Frankenstein’ and Michelle Magorian and David Wood’s ‘Goodnight Mister Tom’. 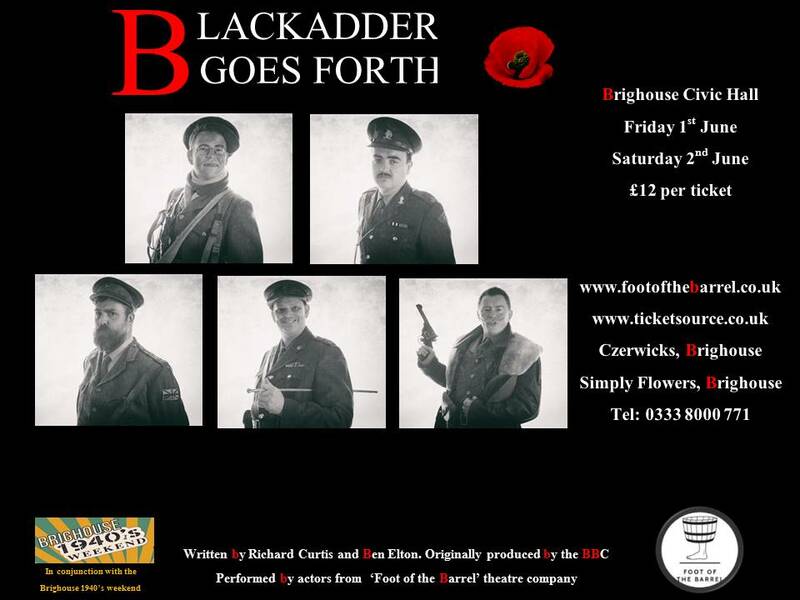 This production happily coincides with the Brighouse 1940’s weekend and the centenary of the end of WWI. Tickets to this event will sell quickly so please book early.